This one’s a must-listen for the bass enthusiast, and space enthusiast. It comes as a release 7 weeks after bass-lover retreat minifest Solasta which was held August 17-18, 2018 at Spirit Crossing, TN with a single stage and single superwide river (the clean Clinch River) that’s bound to draw back attendees for years to come so long as it’s put on again. The quality of the minifest was on point with all details attended to and well-executed, that included a superior soundsystem and high quality music selections for all involved. Beautiful bass set after set included an all-analog hour set from Earthcry that was especially memorable, but this one was also a major standout. And we’re glad to see female badasses slinging the bass on the DJ decks. Her refined taste reflects cutting edge, mid-to-high tempo psychedelic bass — specifically halftime, dubstep, drum & bass, glitch-hop, psybass and dark prog. With over a decade of music industry experience under her ray-gun holster, spacegeishA embodies genres from underground black holes to radioactive cosmic rays, establishing a cumulative universe of freaky, hard-hitting wobbles and whomps. Her musical collages reflect the dedicated selecting and skillful sampling of a true celestial being. spacegeishA has abducted crowds at festivals from Lightning In A Bottle and Symbiosis to Enchanted Forest, Serenity Gathering, Solasta, BOOM Festival, Lucidity and Burning Man. 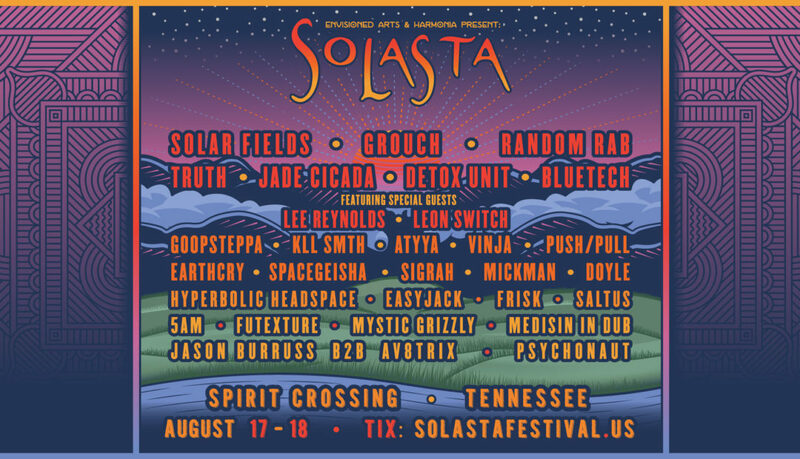 Here is the full lineup from Solasta festival. We await the rest of the sets to be posted from these amazing and talented artists at the forefront of the bass music, electronic music festival and experimental scene.